While we're all watching Spain and Greece, their alleged saviors in the rich core of the eurozone are starting to show serious signs of corrosion. This makes all the hollow words and promises coming from the world of troikas and politics sound even emptier than they already did. Not that anyone in Holland or Germany seems to even be prepared to think their economies are in for a big fall; for them, all the bad stuff is temporary, and soon it will all be better. Our proverbial Martian might be tempted to think denial is a river in northern Europe. To wit: after a slew of reports on the housing situation in Holland earlier this year, by the Dutch government's Central Statistics Bureau, the Dutch Central Bank and the Central Plan Bureau (CPB) - got to love the name -, the real estate sector itself issued a paper today, which, despite the obvious bias, makes everything look worse. Again. As I wrote in Those Dutch Tulips Ain't Looking All That Rosy last month, home prices in Holland rose some 20% annually around the turn of the century/millennium, for a total of 228% from 1985-2007. House prices fell 8% from a year earlier, statistics bureau CBS said Tuesday, the largest decline in the 17-year history of the agency's house-price index. Prices fell 4.4% in June and 5.5% in May. [..] House prices have fallen about 15% since their peak in August 2008 amid a stagnant economy, more stringent bank-lending criteria and weak consumer sentiment. Today, the NVM (Dutch Real Estate Brokers Association) announced that among its members (good for 86% of transactions), Q3 sales were down 17.2% (!) from Q2. Home prices fell 2.2% from that quarter, and 7.5% from Q3 2011. Average home prices are now down 21% compared with 2008, from €265,000 to €209,000. 700,000, or over 20%, of Dutch homeowners are now underwater. The NVM expects 100,000 homes to be sold in 2012, and labels this the "absolute bottom". Still, in Q3 just 18.664 homes actually were sold, so this looks like just another case of false bottom calling. The NVM may not be as bad as the NAR, but the bias is the same. One difference may be that the former still expects the government to step in with subsidies and law changes to stimulate the anemic market, so it has less incentive to make things look better than they are; it walks a bit of a tight rope in that regard. The Dutch government itself would love for the market and price levels to recuperate, since it's on the hook for a major part of the potential losses through a national mortgage guarantee scheme. At the same time, it's planning to counter the overwhelming subprime character the market has obtained through the past two decades (people could borrow 125% or so, over 50% of loans are interest-only, and even that interest is deductible). Hence, the Dutch will be able to borrow less after January 1, and under less favorable conditions. That doesn't add up to stimulus, but to even fewer sales. And that in turn adds up to even lower prices. Rinse and repeat. Still, peering through the reports, and the media coverage they get, one still doesn’t get any sense of alarm. Complacency dictates that the negative numbers are seen as a fleeting phenomenon, and everything will soon be alright again, the housing market as well as the economy as a whole. But if you take that 228% price rise from 1985-2007, you find that this means a home that cost €100,000 in 1985 sold for €328,000 in 2007, lost about 21% since, and is still "worth" $260,000 today. General price levels (what many incorrectly call inflation) may have risen by 56%, but even when including that, you're still roughly €100,000 off the mark. That is, unless you believe that things are going well and have just temporarily slid off the rails. The Amsterdam stock exchange is up 1% today in the face of this really bad housing report: what more do you need? The line between optimism and delusion is at least as thin as the one between love and hate. Of course, Northern Europeans find support for their optimism in the fact that they don’t have the over 25% overall and over 50% youth unemployment that Greece and Spain have. Yet. But let's remind ourselves that, as I wrote in the article quoted above, retail sales in Holland fell 11% in April alone (vs 9.7% in Spain). That's serious stuff, the kind that costs jobs. And that's not going to recover and get back to whatever people think is "normal", and then keep growing on giddily forever. But it will take a while yet before this reality sinks in. These are people who've gotten used to taking 3-4 holidays per year on top of buying overpriced real estate with subprime-like mortgage loans. They've had it all and then some for over a decade, and that's a hard addiction to shake. Optimism, illusion, delusion are much easier for now. Still, if you look at those numbers, and you add to them the fact that Holland is one of the rich core countries that has tens of billions of euros, and counting, at risk in the bailouts of southern Europe, PIIGS, Cyprus, Slovenia, it's hard not to wonder where this is going. And it's not just Holland. Germany too is starting to show cracks. And how could it not? Both countries rely to a large extent for their economic success on exports, of which a substantial part stays in the eurozone. That was the whole idea, after all. With Greece, Spain, Italy, Portugal, Ireland et al in trouble, these exports can only go one way. The effects of this shrinking may be somewhat delayed in the richer countries, but of course they must be felt at some point. That is, unless other exports markets are found, conquered and developed, but that hasn't happened. On Monday, France indicated that car registrations there dropped by 18% in September against the same month a year ago. In Italy, the drop was 25.7%, whereas Spain saw registrations plummet by a whopping 37%. Overall, the European Union has seen a 7.1% drop in new registrations over the first eight months of the year, with final numbers for September still pending. Italian media is reporting on Tuesday that some 1.75 million bicycles were sold in the country in 2011. It was the first time ever that cycle sales exceeded that of automobiles. This week, Der Spiegel even had this to say about GM's main longtime subsidiary: The End Might Be Near for Opel. Sure, not all German carmakers are as down and out as Opel is. BMW, Audi, Mercedes can keep growing for a while longer in China, for example. And part of the whole thing is a natural selection type survival of the best and brightest. But the overall net effect of those plunging sales is very negative for the German economy. And the French. And eastern European, where the Czech Republic, Hungary, Romania, Slovakia rely on car factories for a substantial segment of their economies. There's a vicious circle somewhere in there that will draw down the core countries as well as the peripheral ones. But the periphery will be much faster in accepting and realizing that simple truth than the core will. Which means, it doesn't get simpler than this, that the core will have no time to prepare; it's all illusion all the way, until one day there's a loud sucking sound. Accumulated cross border claims are now so extreme that they threaten to leave German taxpayers with huge losses should the euro break up, or if any one of its members leaves. What makes this debate of particular importance is that it is German opposition to debt pooling in the eurozone that is generally thought, at least among the periphery nations, to be the biggest barrier to crisis resolution. If only the Germans would agree to treat Europe’s debts as one, rather than the separate responsibility of 17 different sovereign nations, then all this nastiness would go away. Well, through Target 2, it can reasonably be argued, these debts are already being shared, only many Germans don’t yet know it and it certainly hasn’t cured the crisis. 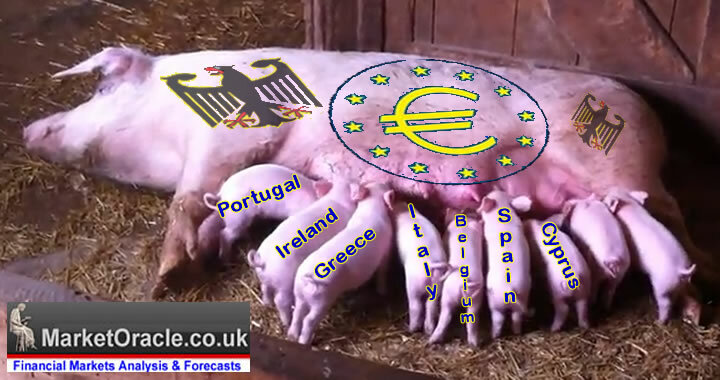 The euro has stuffed the Germans just as much as the Spanish, Italians and Greeks. Hey, at least it seems to make it easier to understand why Merkel says she would like to keep Greece in the eurozone. Even though the fear of a (domino of) credit event(s) as a result of a member leaving will always be in the number one spot. So what then are we to think when the IMF says European banks need to sell $4.5 trillion in assets? What assets will they sell? Who are supposed to be the buyers, and what discounts will they demand? What will then be left of these banks? What if another round of writedowns is necessary on Greek debt? What about writedowns on Spanish debt? In April, the IMF forecast asset sales of $3.8 trillion in a “weak policies scenario.” Since then, policy makers’ delay in taking decisions to solve the crisis worsened funding pressures while the relief provided by the ECB’s program of unlimited three-year loans faded. Whether the core like it or not, the deleveraging continues. That means there will be less money to spend, and it also means more money will have to be spent on "saving" the banking industry, and the periphery. We're on no road to no where. You know, Merkel may go to Athens, and soon to Madrid, and anywhere else she wants, and the other "rich" core countries may pretend they're wearing all the rich garments they want, but in the grand scheme of things it doesn't really matter. Let them open their books, and if the numbers in the books look good, they may survive. If they refuse to open them, they won't. They'll be fish in a barrel, in the exact same way that Greece and Spain are today. Market confidence in the latter will return only when all issues and problems are on the table, not when €100 billion left or right are handed over while the table stays empty. That just moves money from the public to the private sector. And that in turn weakens the public sector, which, of course, destroys confidence instead of strenghtening it. Things are not always what they seem. We can live in illusions for a period of time, but those periods are always limited. All of Europe's countries would do better to recognize their real predicaments, and prepare for their real futures. But that's not the kind of platform that politicians get elected on, and so it will not happen. People will vote for those who feed their illusions, not those who tear them apart. Our proverbial Martian might say that is one of the perils of democracy. © 2012 Copyright Raul I Meijer - All Rights Reserved Disclaimer: The above is a matter of opinion provided for general information purposes only and is not intended as investment advice. Information and analysis above are derived from sources and utilising methods believed to be reliable, but we cannot accept responsibility for any losses you may incur as a result of this analysis. Individuals should consult with their personal financial advisors. Europe's still militarily occupied and culturally controlled for the sake of those who own the banks and big companies.